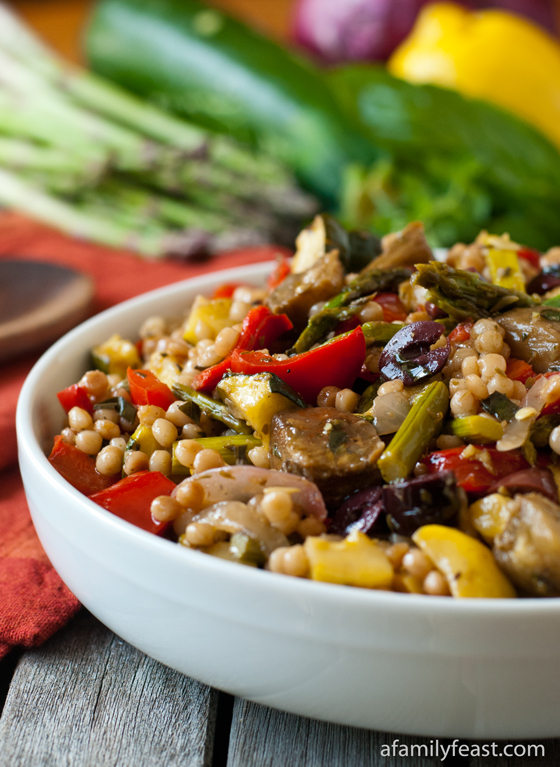 We are absolutely loving the fresh veggies at our local farmer’s market right now, and this Israeli Couscous Salad with Mediterranean Roasted Vegetables is the perfect way to enjoy in-season vegetables! 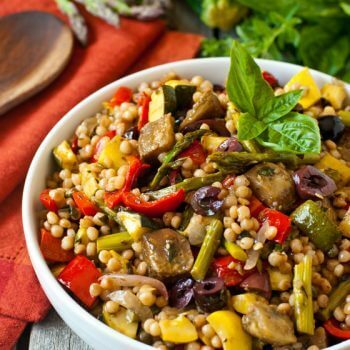 A medley of asparagus, zucchini, yellow squash, eggplant, red bell pepper, and onion are roasted in the oven until caramelized, and then tossed along with toasted Israeli couscous in a flavorful vinaigrette. Kalamata olives, capers and fresh basil and oregano are also added – giving this salad wonderful Mediterranean-inspired flavors! 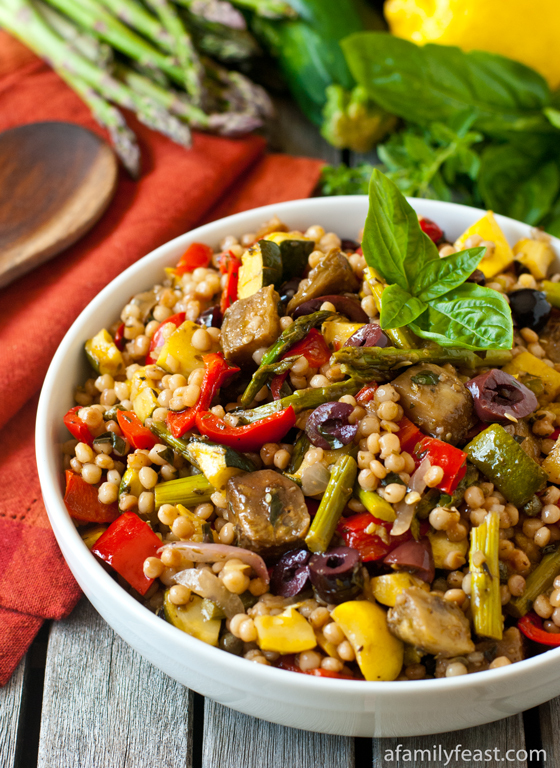 We’ve been so busy this summer – constantly on the go – and I love dishes like this Israeli couscous salad with Mediterranean roasted vegetables. This recipe serves six to eight generous-sized portions so it’s great for a light and healthy dinner, and any leftovers make a great lunch-on-the-go the next day! 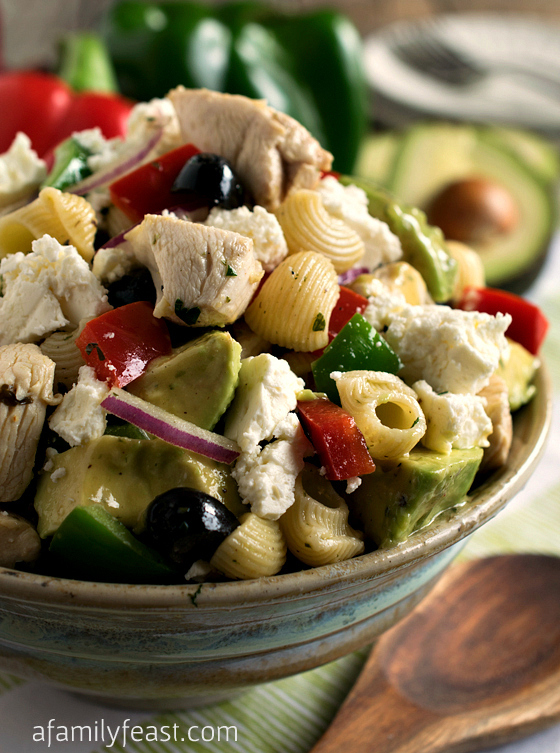 You can even add some cooked chicken to this salad if you’d like! And Jack also added some feta cheese to his leftovers – which works really well with the other briny, Mediterranean flavors in this Israeli couscous salad. 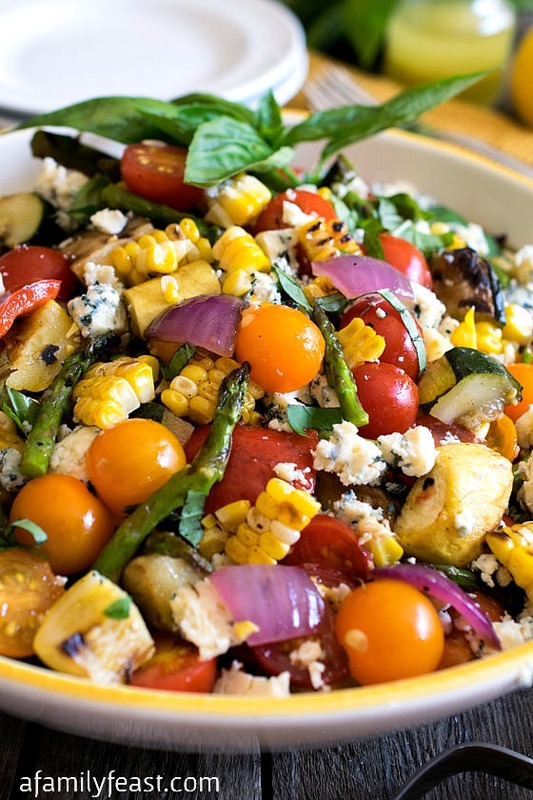 And with all of the yummy roasted vegetables included – you’re eating healthy too! 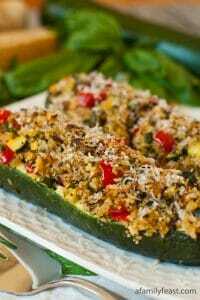 In a large bowl, place asparagus, zucchini, yellow squash, eggplant, red pepper, onion, oil, salt, oregano, and garlic powder. 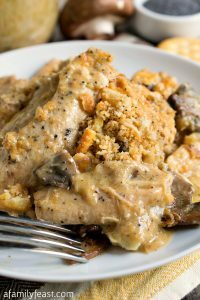 Mix to combine and pour out onto a sheet pan in a single layer. Roast vegetables for 10 minutes, flip and roast for 10 more. They should be slightly browned but still have some bite to them. Place vegetables back into large bowl and add olives, basil, capers and the ground black pepper. While couscous is cooking, make the vinaigrette. Place all vinaigrette ingredients except the oil into a medium bowl and whisk. Slowly drizzle in oil while you whisk. Set aside. 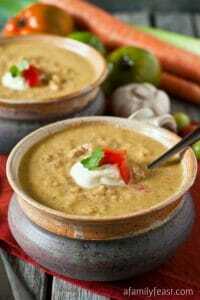 Once couscous is cooked, drain thoroughly in strainer and add hot couscous to roasted vegetable mixture. 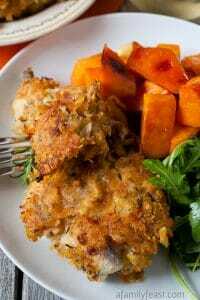 Toss slightly then add in vinaigrette. Toss again. Let sit for 30 minutes at room temperature so couscous can absorb the vinaigrette and flavors. 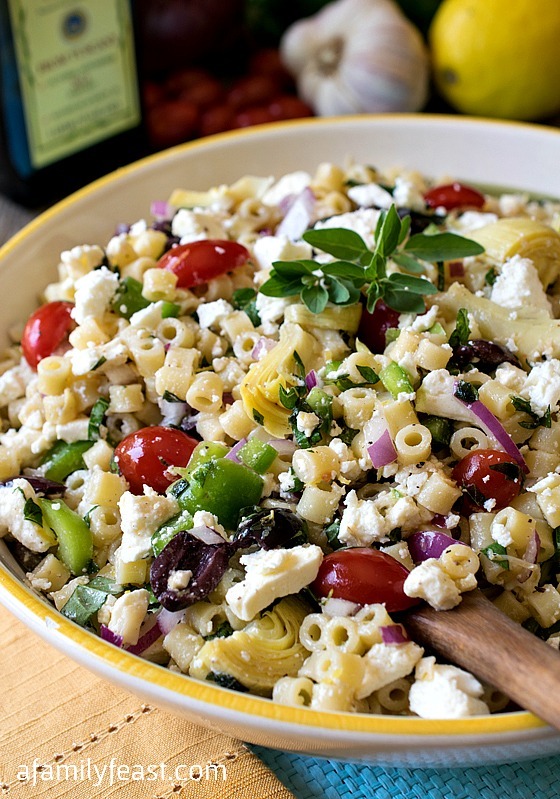 If you are adding the feta cheese, add this in now, however the finished dish is very good as is. Serve immediately. I made this recipe for my family gathering on saturday and it was delicious! Thank you for the idea! How come when I look up your recipes by categories it only list like 5 recipe per section? YUM! I love Mediterranean Flavors! This is an awesome salad!